Special effects are the exclamation point in the event vocabulary. These attention getters enhance the event atmosphere and always leave a lasting impression with any audience. Use them to direct attention, dazzle, excite or surprise at any celebration. KM uses an array of materials to create fantastic effects that transport guests into another world and leave them awestruck. NYC law requires special pyrotechnic and effect permits for an event using any type of atmospheric effect. Our team will file the proper permitting on your behalf and can insure the uninterrupted operation of these machines. KM provides confetti cannons stocked with the Mylar confetti. Multiple color options are available. Mylar offers that extra shine and creates an extremely dynamic scene when interacting with the lighting as it floats down and throughout an event space..
KM provides confetti cannons stocked with the rice paper confetti. Multiple color options are available. Rice paper is our eco friendly confetti option and the only confetti approved for use by the New York City for outside events held in NYC. Lasers take any show to the next level. KM offers both laser beams and laser graphics. Audiences will see structures like fans, cones, etc. with laser beams. We can also create a display with the client's logo using laser graphics. KM offers a selection of different laser options to fit any scale: 10 watt - 40 watt full color lasers, crowd scanning lasers, moving head lasers and 3D aerial animation. It's not a party without a disco ball! KM keeps a selection of mirror balls in a variety of sizes and colors in our inventory. Our team can spin the ball at a static height or variable heights with hoist integration for a more dramatic effect. Custom colors and sizes available upon request. Set the right mood with haze. This effect makes lighting pop, people seem more mysterious and performances more impressive. We offer Hazebase, Martin and Look Solutions hazers to create the perfect atmosphere at event or concert. Add serious drama to an event or performance with low lying fog. This fog is thicker than haze and stays close to the ground. We offer machines with and without the use of CO2 tanks. We also offer dry ice units, which produce a similar effect on a smaller scale. Cryo jets are always a crowd pleaser. Depending on the size of the jet, stunning plumes of CO2 can reach up to 30 feet high. Kabuki curtains provide a dramatic reveal that captures everyone's attention. Our kabuki system is available in modular sections or individual nodes. Both systems can be controlled by a one trip mechanism or lighting console. We can provide the curtain or work with designers who prefer to create their own. Make guests glow at any event with black lights. Black lights are great for creating a colorful atmosphere. We offer both conventional and LED blacklight units. KM offers flame cannons, fireworks, sparkler fountains and more. We can also help you navigate and secure the proper permitting needed to add show stopping pyro effects to your event. 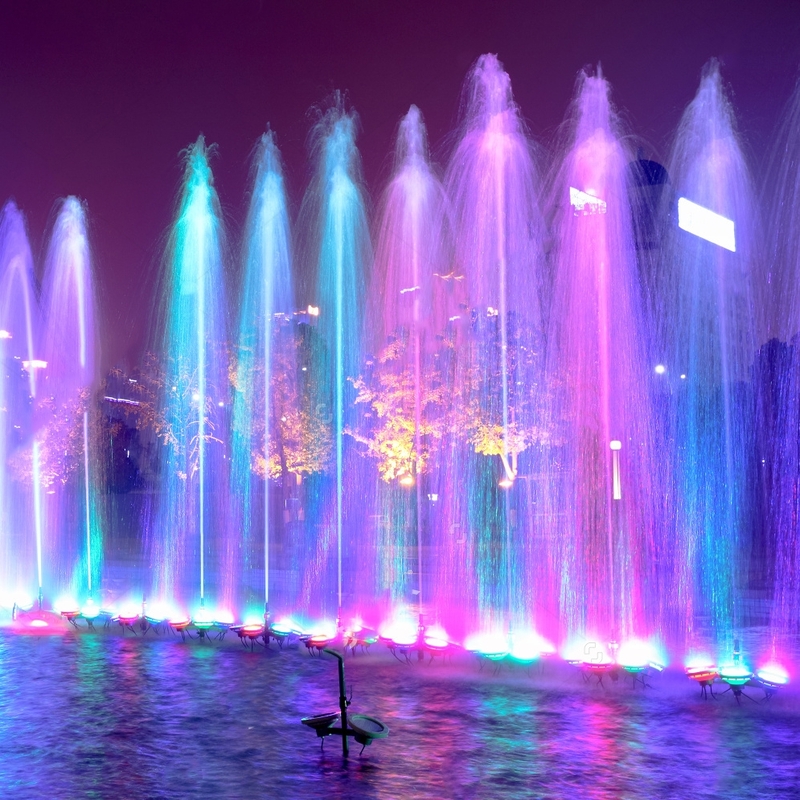 KM is able to create colorful waterfalls and dancing fountains that will intrigue audiences and guests using water-resistant lighting and projection technology.